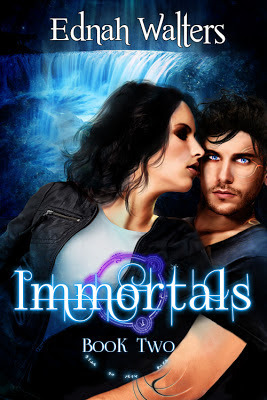 Welcome to my stop on the blog tour for Immortals by Ednah Walters hosted by Xpresso Book Tours. For my stop I have a review, top 5 from the author, and a giveaway. Be sure to check out the other stops on tour, just go here. But she quickly learns that well-laid plans do not work when dealing with deities and supernatural beings. Desperate, Raine makes choices that could not only tear her and Torin further apart, but lead to the destruction of everything and everyone she loves." I have been dying to read this book ever since I finished Runes. Anyone who read Runes, knows that the ending breaks your heart. I was dying to find out what happens next, but I was also worried the sequel wouldn’t live up to the first book. Immortals was just as good as Runes, I actually think I liked it a bit more. Raine is my favorite kind of heroine. She is spunky and feisty and doesn’t back down. She faces her problems head on and always has a plan. When she is determined there is nothing that can stop her. She is also the kind of heroine who will ask for help and she isn’t really one for secrets, at least not when it comes to important people. I love that she is spunky without being too tough to ask for help. Then we have Torin St. James. Guys, I love Torin! He is cocky and arrogant and a badass, but he is also a great guy and will do anything for Raine. I love his smartass comments and he never ceases to make me laugh. He reminds me a lot of Daemon Black and Daemon is my very favorite. I also love that he trusts Raine and doesn’t suffocate her. Yes he is protective, but not to the point where he tries to lock her away. He knows she is strong and can handle whatever this crazy life throws at her, but he will always be there to back her up. Now this next paragraph will be spoilery for those of you who have not read Runes as it deals with a major twist at the end, but it also plays a big part of Immortals. So if you do not want to be spoiled, please skip to the next paragraph. My one complaint with Immortals dealt with the memory loss Torin had at the end of Runes. I absolutely hate memory loss as a rule. I don’t mind when a book begins with a character not remembering anything because then the story is a mystery both myself and the character uncover. However, when I have met a character and experienced things with a character, I hate when the character loses the memories we have experienced. To me it feels like a cheap way to move the story along and I feel like I have to re-learn things I already know. Basically I just get very very frustrated. So to say I was worried about Immortals is to put it lightly. I came to really love Torin and I didn’t know how long I could handle him without his memories. With that being said, despite my issues with this kind of plot line, it was done well in Immortals and it wasn’t drawn out to the point where I wanted to rip my hair out. I did get frustrated, but not as much as I had anticipated. Other than the one thing above, I really loved the plot in Immortals. There were twists and turns at every corner and you never knew who to trust. I could not put the book down and I also couldn’t guess who was behind it all. Every time I thought I had the story figured out, something would throw me for a loop. I loved that! I loved that I couldn’t guess and that the story kept me on my toes. As I’m sure most readers can agree, it’s not always easy to find a book that can do that. All in all, Immortals was a great follow up to Runes. Even with my one hang up, I ended up enjoying it more than Runes. It is everything I want from pararomance. From the feisty heroine to the swoonworthy hero its perfect for paranormal fans. She listed some awesome books! Not going to lie, I really LOVE that Apollyon is on the list. This series sounds right up my alley! YES! Get to it and let me know what you think. Great review girl! I liked Runes ok, but I held off on the Immortals tour until I saw some of you guys read it. I was nervous as to how she would handle the memory loss thing and I'm with you, I'm not a big fan of that either. I'm glad you still enjoyed this and I think I will end up picking it up at some point! The memory loss was handled well in this, and it doesnt really drag. Its a good sequel! I haven't read the first book, but I've heard good things. It's always awesome when book two exceeds expectations. Great review, Teresa! This one is on my list to read! Ooh, I love it when I love the first book in a series and then I love the second even more! I've had my eye on this series ~ love the covers. ;) I'm definitely going to read them. Thanks for a great review, Teresa!